Ace Attorney is a franchise that managed to defy all expectations and find a huge audience all over the world. Despite the lack of interest in visual novel games at the time, Capcom reached out to individuals who had no prior interest in the genre. With six fantastic games in the main series, there’s plenty for fans and newcomers to enjoy. If you’ve somehow missed out, then the first three games are coming to all modern platforms later this year. It’s certainly an exciting time for Ace Attorney fans since the franchise has finally gone from being a Nintendo exclusive to a multi-platform franchise. As popular as the series is, some of the games weren’t brought over outside of Japan. 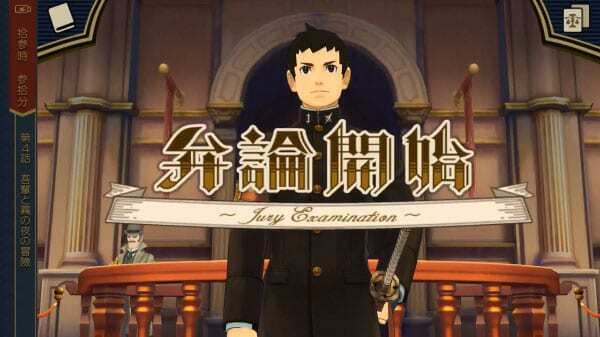 The Dai Gyakuten Saiban duology is a spin-off about Phoenix Wright’s ancestor, Ryunosuke Naruhodou. The two games are exclusive to Japan, and there’s no sign of them receiving a localization in English. Yet, I’ve managed to play through 70 percent of the first game without knowing a lick of Japanese. Hang on, this is an interview, not a cross examination! It’s all thanks to the Scarlet Study. They’re a team of fan translators who have taken it upon themselves to bring the joy of Ace Attorney to the world. So far, they have translated four out of five episodes and are hard at work on the last one. Recently, I had the opportunity to interview the members of Scarlet Study about the general and specific nuances of localization. The team used their Discord names and that’s what I’ll be referring to. So, here is a link to their credits. It details all of the members and their roles in the project. A toast to the Scarlet Study. GameLuster: I’d like to start by thanking everyone here. I appreciate everyone taking the time to do this. My first question is about the origins of the project. How many of you were there since the beginning? Henke37 (Code/Reverse Engineering): Basically, we’ve found people from all over the internet. Some, like me, were veterans from the Gyakuten Kenji 2 translation. Other were from other groups. Masterofmemes (Head of Translation): In summary, there’s a big nebulous cloud in which it’s something like: Henke > Xz > Uwabami/StarStabbedMoon > SethZ/Joshkinz > Episode 1 Release > Me > Everyone else. (Author’s note: order of events). GL: Was there another team working on a translation before you started? I remember something like that but I could be mistaken. Henke37: Not to my knowledge. Xz (Text Insertion/Editing): I don’t believe so either. Hyarion (Code/Reverse Engineering): The Dai Gyakuten Saiban demo was released with a “Team IF – DGS Division” splash screen. So, that may be what you recall? (Author’s Note: Team IF – fan translators who did a re-translation of Fire Emblem Fates). Henke37: I thought it was the cr.net forums? Masterofmemes: Team IF veteran here. I’m actually the most ancient among us. StarStabbedMoon (Admin/Text Insertion): Well, there was the YouTube translation that was referenced. Masterofmemes: In summary, part 2: No, no other full-on translation efforts to our knowledge. But, we were kinda-sorta under a different group for a while so that was printed on the demo release. Though there are two YouTube translations that are complete, so to speak. The translation retains the feel of the source material. GL: In your translation, you kept it as close to the source material as possible. Which got me thinking about Capcom’s official localizations. Would that be possible for this game at all? Uwabami (Admin/Translator): Our official stance is no. Henke37: You mean the translation changing the setting? Nope. That’s a bad idea given the overarching plot is about two specific nations. Uwabami: Yeah, as you can see, it would be very difficult to fit DGS into the existing Ace Attorney “Japanifornia” universe. We are aware of other people trying to do just that, but let’s leave it at this: It’s not what we want to do. But, let me clarify one thing people get wrong. 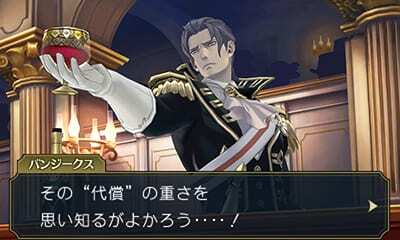 We are – in fact – localizing DGS. We try to make jokes and puns work and rewrite things to make them more accessible to the end-user. What we do not do is Americanize it. As in, we do not change the location and we avoid changing the nationality of any character. Generally, we don’t change the names of the characters, as many are references to the Sherlock Holmes universe, but there are exceptions. Though, for the currently released episodes, there is only one. Keeping true to the source material is no small feat. GL: Would that be Ladyfirst? Henke37: Nope. Ladyfirst is what the game uses internally. We are 100 percent on his name. Masterofmemes: Ladyfirst wasn’t changed. People who say “redifast” are stupid. Uwabami: Maybe we should elaborate on this. Both “Ladyfirst” and “Redifast” would be valid readings of the Katakana used in the game. But we confirmed “Ladyfirst” in the game’s code and we also liked it better. Uwabami: It wouldn’t be the first character with a stupid name in an Ace Attorney game, would it? Henke37: Look forward to the antagonist of DGS Episode 5, now that’s a silly name. Uwabami: To answer your previous question, the only character with a changed name so far is the cat in DGS Episode 2. Masterofmemes: Quick note about the names. Lately, I’ve been kinda pushing toward “very slight phonetic changes in names” that reveal an acceptable English equivalent of the pun. Since many of the one-off character names are Japanese puns. Uwabami: There may be more changes in the future. Only if they are not references to the Holmes universe. Hyarion: At any rate, if I can add my personal thoughts on our localization approach. I feel like adding in that extra layer of Japanifornia would get in the way of presenting a clear and accurate representation of the original game. We’re only a small team, after all, and not professionals. Not to mention, with the Android patch now released, our translation is more accessible than ever. It’s my hope that we can bring in even casual fans who normally wouldn’t bother with a fan translation. Localization has more to it then just broad topics. The finer points and polishing are just as important. Stay tuned to GameLuster as we delve further into the challenges of bringing a game to vastly different audience in Part 2 of our interview.